Glass Lewis 2019 proxy advice updates address many issues. See 2019 Proxy Paper Guidelines: An Overview of the Glass Lewis Approach to Proxy Advice. Such a company no action request is similar to the situation where voters in certain states have the right to put an initiative on the November ballot on a proposed statute because the legislature ignores the issue. There is no state that then allows the legislature to scuttle a qualified initiative by simply asking voters to ratify the status quo on the subject of the initiative. This underhanded tactic was used by Capital One Financial Corporation (COF), CF Industries Holdings, Inc. (CF), eBay Inc. (EBAY), NetApp, Inc. (NTAP), Skyworks Solutions, Inc. (SWKS), AES Corporation (AES), JPMorgan Chase & Co. (JPM) and possibly others. I will be watching these firms in 2019 to see what other undemocratic processes they adopt. I hope the Glass Lewis 2019 update will be taken seriously and that these companies and others will no longer seek to game the system. Our policy regarding board gender diversity, announced in November 2017, will take effect for meetings held after January 1, 2019. Under the updated policy, Glass Lewis will generally recommend voting against the nominating committee chair of a board that has no female members. Depending on other factors, including the size of the company, the industry in which the company operates and the governance profile of the company, we may extend this recommendation to vote against other nominating committee members. Also, when making these voting recommendations, we will carefully review a company’s disclosure of its diversity considerations and may refrain from recommending shareholders vote against directors of companies outside the Russell 3000 index, or when boards have provided a sufficient rationale for not having any female board members. Such rationale may include, but is not limited to, a disclosed timetable for addressing the lack of diversity on the board, and any notable restrictions in place regarding the board’s composition, such as director nomination agreements with significant investors. In instances where companies place on the ballot both a management and shareholder proposal requesting different thresholds for the right to call a special meeting, Glass Lewis will generally recommend voting for the lower threshold (in most instances, the shareholder proposal) and recommend voting against the higher threshold. In instances where there are conflicting management and shareholder special meeting proposals and the company does not currently maintain a special meeting right, Glass Lewis may consider recommending that shareholders vote in favor of the shareholder proposal and recommending that shareholders abstain from voting on management’s proposal. In instances where companies have excluded a special meeting shareholder proposal in favor of a management proposal ratifying an existing special meeting right, Glass Lewis will typically recommend against the ratification proposal as well as members of the nominating and governance committee. Glass Lewis will also be making note of instances where the SEC has allowed companies to exclude shareholder proposals, which may result in recommendations against members of the governance committee. In recent years, we have seen the dynamic nature of the considerations given by the SEC when determining whether companies may exclude certain shareholder proposals. We understand that not all shareholder proposals serve the long-term interests of shareholders and value and respect the limitations placed on shareholder proponents when submitting proposals to a vote of shareholders, as certain shareholder proposals can unduly burden companies. However, in the event that we believe that the exclusion of a shareholder proposal was detrimental to shareholders, we may, in very limited circumstances, recommend against the members of the governance committee. We have codified our approach to reviewing how boards are overseeing environmental and social issues. 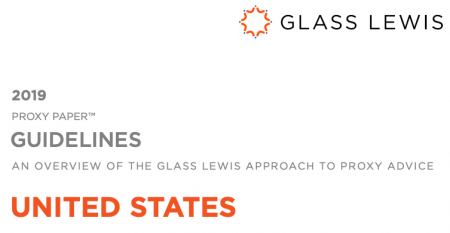 For large cap companies and in instances where we identify material oversight issues, Glass Lewis will review a company’s overall governance practices and identify which directors or board-level committees have been charged with oversight of environmental and/or social issues. Glass Lewis will also note instances where such oversight has not been clearly defined by companies in their governance documents. Further, we have clarified that, in instances where it is clear that companies have not properly managed or mitigated environmental or social risks to the detriment of shareholder value, or when such mismanagement has threatened shareholder value, Glass Lewis may consider recommending that shareholders vote against members of the board who are responsible for oversight of environmental and social risks. In the absence of explicit board oversight of environmental and social issues, Glass Lewis may recommend that shareholders vote against members of the audit committee. In making these determinations, Glass Lewis will carefully review the situation, its effect on shareholder value, as well as any corrective action or other response made by the company. We have codified additional factors we will consider when reviewing auditor ratification proposals, and extended our discussion of auditor ratification to reflect updated disclosure standards. Specifically, additional factors we will consider include the auditor’s tenure, a pattern of inaccurate audits, and any ongoing litigation or significant controversies which call into question an auditor’s effectiveness. In limited cases, these factors may contribute to a recommendation against auditor ratification. Our policy regarding virtual-only shareholder meetings, announced in November 2017, will take effect for meetings held after January 1, 2019. Under this new policy, for companies that opt to hold their annual shareholder meeting by virtual means, and without the option of attending the meeting in person, Glass Lewis will examine the company’s disclosure of its virtual meeting procedures and may recommend voting against members of the governance committee if the company does not provide disclosure assuring that shareholders will be afforded the same rights and opportunities to participate as they would at an in-person meeting. Examples of effective disclosure include: (i) addressing the ability of shareholders to ask questions during the meeting, including time guidelines for shareholder questions, rules around what types of questions are allowed, and rules for how questions and comments will be recognized and disclosed to meeting participants; (ii) procedures, if any, for posting appropriate questions received during the meeting, and the company’s answers, on the investor page of their website as soon as is practical after the meeting; (iii) addressing technical and logistical issues related to accessing the virtual meeting platform; and (iv) procedures for accessing technical support to assist in the event of any difficulties accessing the virtual meeting. When analyzing the performance of the board’s compensation committee, we will now include the inclusion of new excise tax gross-up provisions as an additional factor that may contribute to a negative voting recommendation. When new excise tax gross-ups are provided for in executive employment agreements, we will consider recommending against members of the compensation committee, particularly in situations where a company previously committed not to provide any such entitlements in the future. We have extended our policy regarding contractual payments and arrangements, and clarified the terms that may contribute to a negative voting recommendation on a say-on-pay proposal. When evaluating severance and sign-on arrangements, we consider general U.S. market practice, as well as the size and design of entitlements. When analyzing the performance of a board’s compensation committee, we will consider the impact of materially decreased CD&A disclosure when formulating our recommendations and may consider recommending against members of the committee where a reduction in disclosure substantially impacts shareholders’ ability to make an informed assessment of the company’s executive pay practices. In June 2018, the SEC adopted amendments to raise the thresholds in the definition of “smaller reporting company” (or “SRC”), thereby significantly expanding the number of companies eligible to comply with reduced disclosure requirements. Specifically, a company with less than $250 million of public float, or a company with less than $100 million in annual revenues and either no public float or a public float of less than $700 million will be eligible. Under the lower disclosure standard, a company is only required to disclose two years of summary compensation table information rather than three, and for the top three named executive officers rather than five. Additionally, SRCs are not required to provide a compensation discussion and analysis, or tables detailing grants of plan-based awards to executives. We have added a discussion of grants of front-loaded awards. We believe that there are certain risks associated with the use of this structure. When evaluating such awards, Glass Lewis takes quantum, design and the company’s rationale for granting awards under this structure into consideration. We have clarified our policy regarding “Recoupment Provisions (“Clawbacks”)”, as we are increasingly focusing attention on the specific terms of recoupment policies beyond whether a company maintains a “clawback” that simply satisfies the minimum legal requirements.